My specialty is love, relationship, finances, career, and psychic mediumship. I am honest, accurate, and detailed with reliable timeframes. Call now to get predictions that happen! 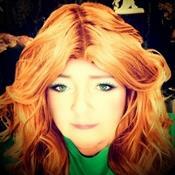 Gab is a second generation psychic medium with over two decades of experience to offer you. She is a noted author, psychic researcher, and founder of one of America's premier award winning Paranormal Research Websites. My first time calling Gab and I will definitely be calling her again! She's very compassionate and funny too! Simply the BEST hands down on Keen! Thank you!! Quick and thorough, consistent with predictions! Psychic Medium Gab is a multi-generational psychic medium who has helped clients internationally for over 20 years. She is a noted author, lecturer, psychic researcher, photographer, teacher, and radio show host. Her book "The Book Of Thomas: A Guide For Life And The Afterlife," was on Amazon's New Age best seller list in 2004 and 2005. Her new book of meditations and prayers came out in 2013. She is the founder of the award winning paranormal investigation team Eastern Paranormal which has documented her extraordinary abilities through photography and EVP. 1/9/2016 Advisor Lilura She is amazing. I read with her last year and she was absolutely accurate about all of her predictions. I am looking forward to seeing the results of her predictions this year. She is a wonderul and gifted reader. Very Accurate, gives extremely accurate time frames, and is very easy to understand. She is very detailed and very quick to respond. 12/28/2012 TouchedByAnAngel VALIDATION UPDATE 12/27 ` I asked Gab about several weeks ago to ask about a large check we were expecting from my husbands work...could come in Dec or Jan is what his office said. We were really counting on the money, so I asked Gab what she thought. She said....late3 Dec. Dec 27 we go it! How is THAT for accuracy! You are simply CRAZY if you dont call her. I can honestly tell you SHE HAS YET TO EVER BE WRONG! i have called her many times over the past four years....and she has consistently ALWAYS been right on. I know alot of psychics and cannot think of ONE who is as accurate as GAB. That includes Sylvia Browne, James VanPragh and others. 1/30/2010 Anastasia Christine Most amazing most wonderful my go to psychic! :) Love her! 10/25/2008 marti28 I have to say that I put you right up there with Sylvia Brown, Jame Van Praagh, John Edwards, but of course "you are in a league of your own". What I really like about you is your confidence. Over the last few months, you helped me connect with deceased loved ones and you've helped me with current life issues as well - YOUR ACCURACY IS UNCANNEY. I CAN HONESTLY SAY THAT YOU ARE THE "BEST ON KEEN"!UNTIL NEXT TIME TAKE CARE AND "GOD BLESS"! 7/10/2008 Tarot With Jane TY Very gifted reader! Psychic Medium Gab has been a user of Keen since 2007. Getting Love & Relationships advice from Psychic Medium Gab through www.keen.com is safe, secure and confidential.